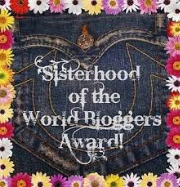 Sisterhood of the World Blogger Awards – Lovely.Multifaceted.Chic. Hello, beautiful people! I was recently nominated for the Sisterhood of the World Blogger Awards by TK Loves. Thank you TK for the nomination! Please go checkout this multifaceted lady and her blog. She has everything from diy-ing (I know, not a real word), cooking, being a fabulous mommy, and so on! 1. Thank the blogger who nominated you, linking back to their site. 2. Put the award logo on your blog. 3. Answer the ten questions they’ve set you. 4. Make up ten new questions for your nominees to answer. Have you ever had a moment where you doubted yourself, and why? Absolutely, kinda! I have 2 explanations. 1) I have had moments where things didn’t work out how I wanted or thought it should have gone differently. I am very type A. I like plans, lists, and order. There have been times I doubted if I should continue a thing or goal, or if I am on the right path. I questioned myself and doubt set in. I have learned not to be hard on myself and allow life to happen. I am learning to trust God’s time. 2) Now that I think about it, self-doubt would set in if I listened to people who did not have my best interest or people who really were not happy themselves. I stopped that and ignore negativity as much as possible. I also, stopped share my dream and goals with people to prevent any negative words or energy in my space (this has been a dream saver). Have you ever had a moment where you were completely confident in yourself, and why? Yes. There was point when I was around 25ish where I stopped caring about pleasing others at the expense of my happiness and contentment. I began to accept and love my imperfections. I stopped minimizing my accomplishments and my amazing-ness to make others feel more comfortable with themselves. I really started to see what self-love and self-acceptance was. I started owning everything about myself. My confidence really began to radiate. Would you rather be remembered for what you can do or who you are, and why? I’d rather be remembered for who I am, definitely. I am not the only person in the world who is good or great at a thing. I intentionally do not define myself through the things that I do. I see the things that I do as an extension of who I am. Yes, I am a really good singer, I am really creative, and I really like fashion. But, I also hold high expectation for myself. I value living and treating people with integrity, honesty, respect and genuineness. The most memorable people in my life had and have beautiful spirits. This is important. Are you doing what you believe in, or settling for what you are doing? How do you know? I am doing what I believe. One thing I have to say is that it is hard to settle when you know your worth and passions. How do you stay uplifted during the hard times in life? What’s your motivation? During the hard time, I get support from my family and my faith. Sewing and making things really helps be channel my energy into something positive. I like listening to music…recently, I have had to deal with some serious things and I have found rap to be very relaxing because it doesn’t make me feel sad or emotional. What is that ONE thing you would change in the world, and why? One thing I would change in the world is that everyone was emotionally/psychologically healthy. What is that ONE thing that motivates you to love, and why? Love motivates me to love. Love is beautiful. Here’s a scripture that sums up why love is so motivating for me. “Love is patient. Love is kind. Love isn’t jealous. It doesn’t sing its own praises. It isn’t arrogant. It isn’t rude. It doesn’t think about itself. It isn’t irritable. It doesn’t keep track of wrongs. It isn’t happy when injustice is done, but it is happy with the truth. Love never stops being patient, never stops believing, never stops hoping, never gives up (1 Corinthians 13:4-7)”. Hmmm…I would say how I think. My mind, my thoughts, my heart, my soul, my intentions…and DNA of course…lol. What inspired you to begin blogging? Did you have any reservations about becoming a blogger? If so, what were they? What have you found to be the most rewarding aspect of being a blogger? What have you found to be the most challenging aspect of being a blogger? Have you connected with other WordPress bloggers? What is your go-to book or blog that you have found inspiring? What are 3 most favorite beauty items? What makes you smile like for real, for real? Brandi! I did it! Thanks for nominating me. My answers are over at hilthethrill.wordpress.com! You have such a genuine spirit. I loved your answers. Thanks for participating. I appreciate that! Thanks again for the nomination! I just posted my answers to your questions.  thanks again for nominating me.